Emiliana (Liliana to family) was a professor of Italian history, whose career paved a path for the recognition and promotion of future generations of female scholars. After receiving her Ph.D. in history from Columbia University in 1948, Professor Noether taught Italian history at New York University, Rutgers University, Regis College, Simmons College and the University of Connecticut, where the Emiliana Pasca Noether Chair in Modern Italian History was established in her honor upon her retirement in 1987. Following her retirement, she continued to share her learning by teaching in various elder education programs. Professor Noether was appointed twice as a Senior Fulbright Research Scholar – in 1964-65 and in 1982 – to further her scholarship in Italian historical studies. She was among the first group of fellows at Radcliffe College’s Bunting Institute when it was founded in 1961 to promote women scholars, an experience that she described as “a second chance…after having been relegated to the professional dustbin” for taking time off to be a parent. She went on to serve as president of the Berkshire Conference of Women Historians and the New England Historical Association, and to chair the American Historical Association’s Committees on Italian-American Historical Relations and Women Historians. 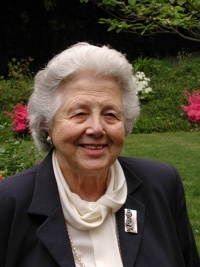 She authored nearly 100 professional articles and books on Italian history and cultural and intellectual ties between Italy and the English-speaking world, and mentored many graduate students – both women and men – over her long career. Liliana was born in Naples, Italy and emigrated to the United States as a young child. She grew up in New York City in a family of Italian musicians and teachers. In 1942, she married Gottfried (Friedel) E. Noether (1915-1991), a statistician and refugee from Nazi Germany, with whom she shared a passion for music, the arts, and worldwide travel. She is survived by her daughter, Monica Noether, and two grandchildren, Braden and Shannon Harvey. Blanca G. Silvestrini, an attorney and historian, who recently retired from the History Department after 42 years in academics, has spent her professional life reaching out beyond the Ivory Tower and the courtroom to students, refugee children and repressed women, among other groups. This spring, Jorell Meléndez-Badillo, a Ph.D. candidate in history, had the opportunity to talk to Professor Silvestrini about her career and her plans for the future. Silvestrini received a doctorate in history from SUNY-Albany; her interests in law and society in Puerto Rico led her to earn a law degree and J.S.M. from Stanford University. The two academic degrees mesh perfectly with Silvestrini’s philosophy and research focuses. “My teaching and research have gone hand in hand,” she told Meléndez-Badillo. “I approach law as a historical product and research how it affects change in society. “ She gave as an example her course in Latinos/as and Human Rights in which she emphasized changes, influences, contradictions, successes and failures of social movements. She said teaching, which she began at age 26 at the University of Puerto Rico, sustains her. Despite administrative jobs in academia, she has always returned to the classroom. She reminds her students that young people created the civil rights movements and have been leaders of their times. Predictably, a teacher first led Silvestrini to pursue history – a turning point in her life that should remind all students of the value of the core curriculum. She had entered undergraduate studies as a math major but an opening in a Renaissance history course, required to take, turned into a breakthrough experience when, knowing her interest in science, her professor suggested she read a biography of Leonardo da Vinci. It is a role Silvestrini has taken on for countless undergraduate and graduate students, who, like herself, she has required to diversify their studies by reading novels and ethnographies and analyzing films, legal cases and statistics. Her focus on interdisciplinary studies was intensified as part of a faculty group that helped create the UConn Human Rights Institute, founded in 2003 by eight Liberal Arts and Sciences academic departments and the Schools of Business and Law to advance the study and teaching of human rights. It now has healthy major and minor programs. Professor Silvestrini has “mentored a generation of historians, social scientists and legal scholars,” wrote Meléndez-Badillo in the introduction to his interview with her. “Working closely with her at the University of Connecticut has transformed my conception of the uses of historical scholarship can have within and beyond the ivory tower,” he continued. A review of Silvestrini’s scholarship and publications makes clear the breadth and depth of her interests. Among her books, in Spanish and English, are studies of female resistance, the politics and violence and criminality of Puerto Rico and the Caribbean as well as the history of that region of the hemisphere. Her countless journal articles take long looks at research resources in Puerto Rico, Latino culture and civil rights, working conditions for women and the Puerto Rican legal system, among other topics. She is also a practicing attorney and serves as a counselor-at-law and consultant attorney in cases related to immigration and Puerto Rican family and inheritance law for a Cambridge, Mass.-based law firm. And although she is leaving the classroom for now, Silvestrini’s creative mind continues to lead her in new directions of research and activism. These fields include legally representing Central American refugee children, health and citizenship in Puerto Rico (the subject of her latest book), and, in a unique avenue of investigation, the cuisine of Puerto Rico at the turn of the 20th century when profound cultural and societal changes were taking place. “The question brings together the social and economic transformations from an agricultural to an industrial society, the impact of the transition fro Spanish to American colonials, the incorporation of women in the work force … and the expansion of the state powers into education, public health and urbanization,” she told Meléndez-Badillo. As weighty as these investigations sound, Silvestrini also said she plans to have some “fun” with the project by finding recipes and collecting stories. How entertaining and educational it will be for all historians to read the results of this undertaking. Thank you, Blanca Silvestrini, for your continued mentoring and work in the field of history. 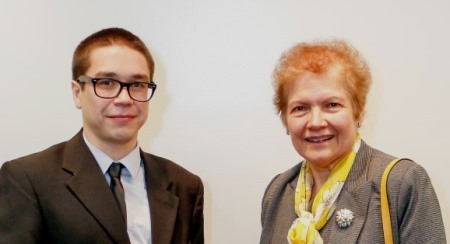 Jorell Meléndez-Badillo, a PhD candidate in History, interviewed his advisor Professor Blanca Silvestrini in Spring 2016. Meléndez-Badillo is accomplished in his own right: he is a 2016-17 recipient of the Ford Foundation Dissertation Fellowship. Terese Karmel, Department of Journalism, wrote this article.